ABUJA, NIGERIA (PREMIUM TIMES)--”I accidentally met over 200 young male and female medical doctors, including consultants in Hawthorn Hotel, Abuja being interviewed by some Saudi Arabian officials to be employed to work in Saudi Arabia. ”At first, I thought it was a conference taking place in the hotel where I visited a guest. I saw an Arab gentleman addressing a mammoth crowd at the lobby of the hotel asking them loudly to ‘go and come tomorrow’. ”I curiously asked a lady who appeared dejected and was waiting with a file in her hand what was happening? ”The lady told me that they were all medical doctors, who were in the hotel since 7.00 a.m. for an interview for employment and that over 100 ‘had been successful’. This is the narration of Shehu Liberty, a lecturer at the University of Maiduguri who on January 31, wrote an open letter on his Facebook wall to President Muhammadu Buhari, pleading with him to make an effort to halt the ‘mass exodus’ of qualified doctors out of the country. “I cannot believe what I saw today. What is really wrong with the health sector in Nigeria that warrants qualified doctors to abandon the country to work in Saudi Arabia? Why can’t the various governments at all levels employ them? I am certain that their services are needed in most rural communities in Nigeria?” he said. There has been a reported massive brain drain in the medical sector in recent years as many medical doctors are leaving the country on daily basis. Nigerian doctors have been migrating to U.S, Canada, Saudi Arabia, the UK and many other nations across the globe, investigations reveal. Relevant medical agencies in Nigeria could not provide official data on emigrant doctors, but statistics from General Medical Council (GMC) UK, as at July 2017 shows that over 4,765 Nigerian doctors are working in the UK. This is 1.7 per cent of the total of the UK’s medical workforce. This trend has been having negative effects on Nigeria’s health sector. As a result of this, experts say, Nigeria is experiencing a shortage of doctors in most of its hospitals. Also, experts say the ratio of medical practitioners to patients in the country is very low. Official records reveal that Nigeria currently has one doctor to attend to 3, 500 patients in the country, which is a far cry to the WHO recommendation of one doctor to 600 patients. A Nigerian doctor working in the UK, Ayokunle Michael, said the situation of doctors migrating from the country is not ”yet bad, but will soon get worse”. He said with the UK opening its borders to commonwealth countries, and many Nigerian doctors having information about the working condition and welfare package there, many are still bound to move. Mr Michael explained that the Nigerian working environment is getting more hostile to doctors. “I left the country almost six years. Before I left, I was struggling to get a good job in spite spending almost nine years in school without failing. I left when it was becoming frustrating and the opportunity presented itself. Some colleagues took the opportunity, while some decided to stay back. Some of those who stayed back are also leaving, the situation is getting worse,” he explained. He said many of his colleagues inducted into the practice in 2010 are yet to find stable jobs. Mr Michael also lamented that medical examinations are getting more expensive in Nigeria. ”The amount paid to do the primaries at the National Postgraduate College of Nigeria or The West African Postgraduate College is getting more expensive. The ‘high dollar rate’ has not also been helping matters,” he said. According to him, ”it is far better to spend less in writing the PLAB (UK examination) which guarantees a better future if the person passes than spending such huge sums on examination that might end up useless”. As at the time of this report, PREMIUM TIMES’ efforts to get the official statistics of number of doctors practicing in the country and those who have left from the Medical Dental Council of Nigeria, (MDCN), the agency which regulates the profession in Nigeria, were not successful. However, the mass exodus of doctors has been a burning issue in the country with officials of the medical association giving various conflicting statistics of their member, especially those who have left Nigeria for greener pastures. MDCN is the agency with the mandate to register and regulate the medical profession in Nigeria. The agency, as part of its duty is tasked with the responsibility of registering newly inducted doctors, renewing licences of doctors in the country and also keeping record of those leaving the country. The agency is also meant to have a record of foreign doctors who come into the country to work. PREMIUM TIMES in a letter dated December 4, 2017 to MDCN, requested the total number of Nigerian doctors currently practicing in the country and those who have left. Another Freedom of Information Act (FOI) reminder was sent to the agency in January requesting for information on the report. However, four months after the first FOI was submitted to MDCN, there has been no response despite numerous visits to the agency by the reporter. 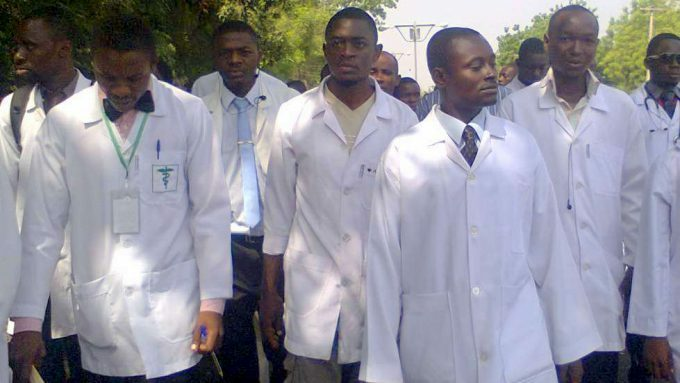 An official of MDCN, however, told PREMIUM TIMES that the agency has ”registered about 80,000 doctors and dentists in Nigeria including foreign trained personnel,” since its creation in 1963. “Out of these 80,000, there are some people who are dead, some have left the country, some no longer working as doctors and some have stopped renewing their practicing licences. Some of the older doctors have been given a ”life time practicing certificate” and do not need to keep renewing their licences yearly,” he said, asking not to be named. PREMIUM TIMES also approached the Nigerian Medical Association, (NMA), for data on doctors in Nigeria and those who have left. The effort was also not successful as the association’s authorities referred the reporter back to MDCN. The association said MDCN is the registering and regulatory body and is the ”custodian of such information and should be the ones to provide such”. According to NMA, ”MDCN is the regulatory body which is responsible for registration, keeping records and disciplinary action of the professional body and as such should be the custodian of the data”. That gives a figure of 9000 -13,500 doctors trained in Nigeria but now working abroad. He said many Nigerian doctors are leaving the country ”due to the unconducive working environment in the hospitals”. ”We need the government to improve the working environment, provide necessary tool for doctors and improve their welfare package,” he said. ”This stamp is expected to have the doctor’s name, registration number and this will enable us have records of the doctors in the country and also help prevent quackery,” he said. However, Mr. Ogirima said the practitioners in the country are registered with MDCN. ”An NMA App will also be available on both android and iOS as from April, every doctor is supposed to subscribe to that and statistics will be made available at the finger tips from NMA office,” he said. An NMA official, Olumuyiwa Odusote, last year said 40,000 out of the 75,000 registered Nigerian medical doctors are practicing outside the country. He also said that in 2012, more than 1,000 doctors wrote exams for the West Africa College of Physicians in order to gain admission into Nigerian teaching hospitals, ”but in 2017 only 236 doctors sat for the same exam”. Mr Ogaraku said the migration of professionals in the hospital is not peculiar to doctors alone. He said other health practitioners such as nurses, pharmacists, and laboratory scientists, among others have also been leaving the country. Mr Ogaraku said the migration of the health manpower in Nigeria has affected many hospitals in many states. He explained that some of the factors responsible for the migration has been the poor working environment which is not friendly. He said the equipment needed to work are not available and this has not given people the ability to do their work effectively. He also said the inter-discipline rivalry between the sectors has also had a negative impact on the hospitals as this is one of the reasons why some doctors leave the country. “The doctors do not like this rivalry as it has made the work difficult. Many health workers now want to do the job of the doctor, some people do not like that and so most of them leave,” he said. The third factor, he added, is the poor and irregular remuneration. He explained that doctors working in Kogi State are currently being paid 60 per cent (of salaries) and there is a 100 per cent tax deduction. He lamented that Osun State for example has been paying doctors half salaries for over a year. “My head of department, a professor, just left the country last year. I do not blame them (emigrants),” he said. Another doctor, Abiodun Babajide, said he has been ”processing leaving the country for two years”. Mr Babajide lamented that he finished his housemanship since 2014 and has since not secured a viable job. “It is sad. When you see most of my colleagues discuss, it is not about where to work in Nigeria, but about opportunities abroad. Most of us want to leave, the country is not conducive for us. It is bad that we spend over eight years in school, not counting housemanship, and yet you find no good job,” he said. ”Most of my colleagues do not even want to write primaries (for the West Africa College of Physicians) again. Why should they? Most of our seniors who did primaries have not gotten placement for residency. Their primaries are expiring without them getting a place to use it. Do you think most of them can pass that examination again? Why should we waste our time here in Nigeria when we hear the way they treat our colleagues who have left the country?” he asked. Speaking on his choice country, Mr. Babajide said he would prefer going to the UK or U.S., ”as they offer doctors one of the best services”. A survey conducted by the Nigerian Polling Organisation, NOIPolls, in partnership with Nigeria Health Watch in August 2017, showed that about eight out of 10 medical doctors are currently seeking work opportunities abroad. This, the survey said, cuts across junior, mid and senior level doctors in both public and private medical institutions. Many, it noted, registered to write foreign exams such as PLAB for the UK (30 per cent), USMLE for the United States (30 per cent), MCCE for Canada (15 per cent), AMC for Australia (15 per cent) and DHA for Dubai (10 per cent) amongst others. Mr Ogirima said a solution to the problem is for the government to bring in public private partnership into the health sector. He said this would enable the system to work more effectively and give room for employment of more staff. “There is a need for state governments to employ doctors as most doctors are jobless. In a country where we don’t have enough doctors, we can’t even employ the ones we trained. The government must increase the capacity of our health institutions, even if it means building more hospitals. “There are several abandoned projects in the country but the health sector shouldn’t fall under such category. Government should build more hospitals, employ more hands because doctors are dying due to fatigue,” the NMA president said.